Dogs or other domesticated animals are not permitted in the National Park! They are also not permitted in most campsites! Please keep dogs and other domesticated animals in the Village area under control at ALL times! 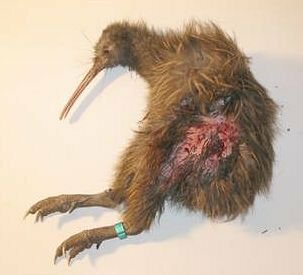 Dog killed Little Brown Kiwi (North Island) Arthur's Pass Village is home to numerous Kea and a small colony of Great Spotted Kiwi (Apteryx haastii). The local community has gone to great lengths to protect these species from predators such as stoats, cats, rats & possums. However, wild and domestic dogs & cats pose the greatest threat to their survival. Kea are unafraid of dogs and will approach them risking possible harm. One dog on the loose is capable of easily wiping out the entire kiwi population should it be allowed to roam free on the forested perimeter of the village. 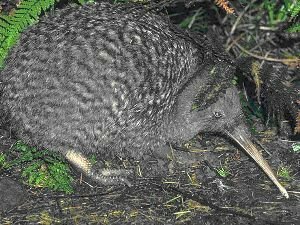 Also a kiwi will not leave its burrow to feed, or cross the path of the scent of a dog, which could also lead to threats to the bird. Unfortunately all cats can be hunters, irrespective of their "at home" demeanor! Cats should be kept indoors, and should be fitted with a collar & bell. All cats found in the National Park are dispatched. Please if you have a dog in the village, please keep it on a leash or under direct control. Should you see a dog roaming loose in the village report it to DOC immediately... Ph. 03 318 9211.